Base of Operations: MattFrank.com. You can find much more of his monstrous artwork here. History: Matt Frank is based in the Golden Land of Texas. He likes pineapple juice. He also loves to draw monsters and anything else that happens to be very, very cool. His comics work includes IDW’s Godzilla and Transformers: Flash Forward and Bluewater Productions’ Ray Harryhausen Presents: Wrath of the Titans. What toys did you collect as a kid, and what do you collect now? When I was but a lad, my room (and our storage space) was practically bursting with toys. I had substantial collections relating to Power Rangers, Transformers, Jurassic Park, War Planets, Mighty Max, Ultraman, and, naturally, Godzilla. Largely this was thanks to my grandmother, God rest her soul, and her predilection towards expressing love via large purchases. Nowadays, as an adult, I’ve had something of a change of priorities without a loss of motivation. 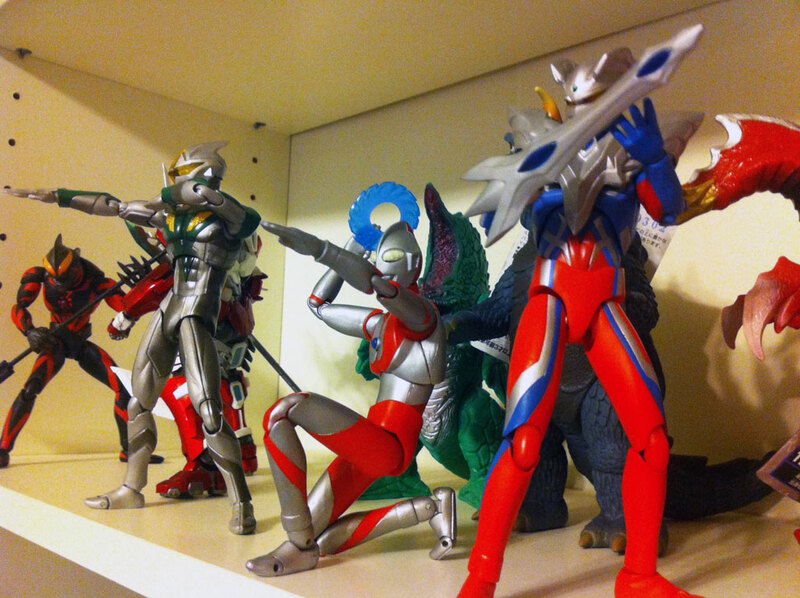 My tastes have been refined, somewhat, in that I’ve trimmed my collecting habits down to mostly Godzilla and Ultraman related swag, with the occasional Transformer, but mostly keeping an eye open for the more interesting or unique toy/figure. For example, I came across a model of Osaka Castle that was quite nicely detailed, and it goes perfectly with my six-inch Bandai Godzilla figures! I also came across a rare Reptilicus figure (an exclusive for the Asian Fantasy Film Expo in 2000) while in New York City, and snagged it for my “rare and cool” shelf. 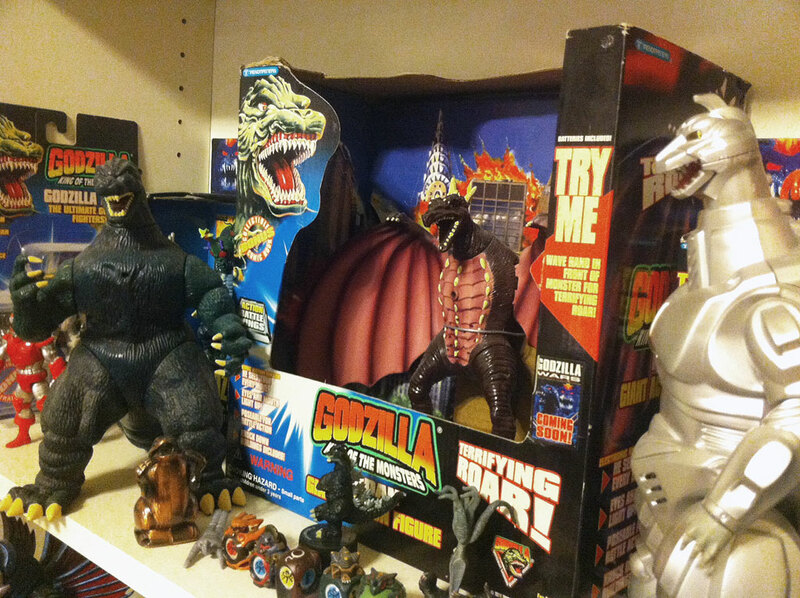 What was your first Godzilla-related toy, and how did you get it? Do you still have it? I believe my first Godzilla “toy” was an inflatable Godzilla produced around the 1980’s that many people fondly remember. Of course, those toys were pretty fragile and it quickly blew a hole open and was laid to rest. That was a parental gift, I recall, and it was before I had ever even SEEN a Godzilla movie. My first Godzilla action figure was the six-inch Imperial figure, also from the 1980’s, and was the “sister figure” to the giant foot-tall Godzilla. My first inclination towards actually collecting Godzilla toys happened when my grandmother purchased all six of the initial line of the Trendmasters Godzilla electronic figures (something my parents were none too pleased with). And that was the downward spiral! Have you ever used a toy for an art reference, and if so, which? 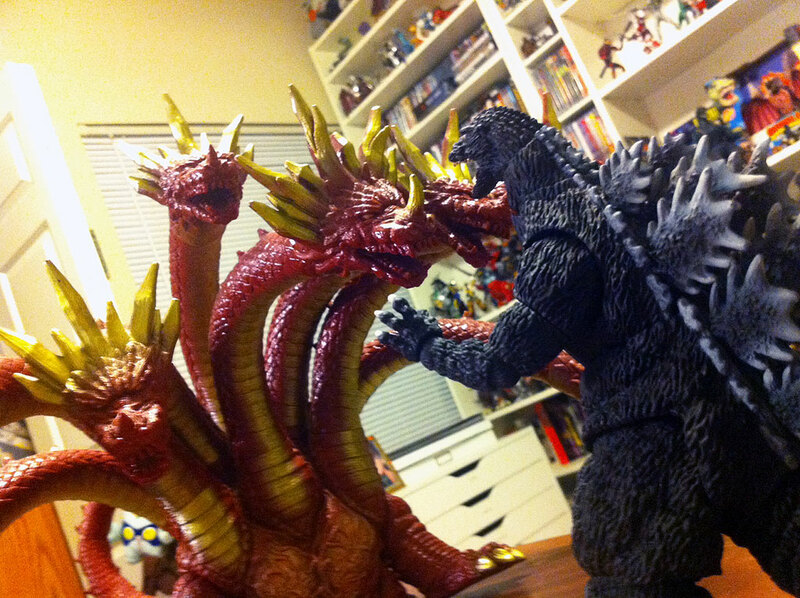 I use my toys as references quite frequently, but perhaps a specific example would be in order: when commissioned for the first issue of Godzilla: Legends, the star monster, Anguirus, required me to be intimately familiar with the monster…unfortunately the only figures I own of that character are the relatively sub-par Bandai six-incher and the cool-and-rare-but-inaccurate Trendmasters toy. Luckily, my friend and talented artist Paul Hanley had recently acquired the Revoltech Anguirus, a very accurate and very poseable figure. I borrowed it for the duration of the project and took my sweet time returning it. What is the most expensive toy you own? Which is your favorite? At the moment, the crown of my collection is the gigantic Bandai Yamato-No-Orochi, the final antagonist of the 1994 Toho fantasy film Yamato Takeru, released in the US as Orochi the Eight Headed Dragon. Orochi is a monster from Japanese mythology, a hydra-like dragon with a sweet tooth for young maidens and sake, the latter of which used to finally destroy the monster. The figure itself cost me about $120, but I’ve seen it go for north of $200 to $300. It’s well over 2 feet in length and has eight swiveling heads and a long, wicked tail. It also dwarfs just about every other toy I have, perhaps only the Hasbro Cloverfield monster stands a chance against it. Godzilla Neo was just a little fan pet-project I started back in 2007. Kinda like an Ultimate Marvel Universe take on the Godzilla mythos. Looking back on it, I had a blast, but if I did it today it would be MUCH different! Love Frank's work. He's cemented himself as one of the great Godzilla artists- up there with Eggleton and Adams. I kinda wish Toho and IDW would give the man a chance to do Godzilla Neo in a maxi-series or something. Team him with a good writer and do a re-boot/recreation of the G films in a special series. His amalgamation of the Toho film universe is smart, and his re-designs are respectful and interesting rather than dismissive or boring. Never happen, but I can dream. It puts a smile on my face when true fans get a chance to work on the things that made them fanboys in the first place- like when Don Figeroa and Gudio Guidi picked up work on the Transformers comics and toy boxes (creating some of the best TF art ever made). Met Matt at Dragon*Con this year and talked monsters. Great fun, and he drew me an awesome pic of Gigan fighting Hedorah. I do agree that Team him with a good writer and do a re-boot/recreation of the G films in a special series.